Local newspapers are viewed as three times more trustworthy than social media as a source of local news and information, new research has revealed. A YouGov poll, commissioned by regional press industry marketing body Local Media Works, saw 74pc of respondents agree that they trusted the news and information in their local newspaper. This compared with local commercial TV and local commercial radio, both at 73pc, search engines at 43pc, other wesbites at 39pc and social media at 22pc. A total of 2,131 people took part in the survey which was conducted at the beginning of last month. 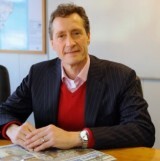 Craig Nayman, pictured, Local Media Works chairman, said: “This survey provides yet more compelling evidence of a resurgence of trust in traditional media outlets, with local media leading the way, as the public become increasingly aware of the dangers associated with social platforms and fake news. The research also showed that local newspapers are websites are read by an estimated 42m adults in the UK. The YouGov findings echo those of the another recent survey by the Edelman Trust which found that trust in traditional media in the UK is at its highest level in six years – up 13 points to 61pc. At the same time, trust in social platforms has dropped to 24pc while trust in search engines has dropped to 47pc. I’m sorry, but this is ridiculous. I’m now out of the game and am saddened by the number of people knocking the paper I still regard as ‘mine’, where I worked first, where I grew up. It’s a joke. Mistakes, old news, news penned by people who don’t know the history of stories and have obviously made no effort to find out or ask pertinent questions and, most tellingly, a desire to rely on press releases and clickbait from elsewhere in the newspaper group stable. On all the news and sports forums I keep an eye on, no-one has a good word to say about it. When we still got readership figures it was appalling how far the title had fallen. When we still had web figures, something didn’t quite add up. Local journalism is being strangled with no emphasis on quality or getting it right by the bosses. Yet another rosy poll comes along. When looking for news, be it world,national or hyper local, people use preferred sites: BBC NEWS / BBC Local Radio/ SKY/CNN etc for all the obvious reasons of it being instant and up to the minute, with audio and video,live updates, comment and direct links to other ‘relevant’ sites.all unencumbered by pop ups, video ads and wholly irrelevant add on space snored content. Local Newspapers have lost their markets and readership bases and aren’t investing in quality content or journalists to attempt a reversal skd advertisers go where the readers , their potential customers are so trying to convince anyone that local papers are the go to medium for trusted news any longer is complete folly. Sadly I agree with “saddened journo”. I am not saying everything was perfect years ago, (there were always slackers to carry) but it was a lot better. My once local paper is now cobbled together about 20 miles away by strangers who know nothing about the area it served and printed about 200 miles distant. It was once written at a local office with a local editor and local reporters with local contacts and for many years printed in the same building, then after that at least locally. It might well be that local papers are still trusted, but they are not as respected as they were because the style, grammar, construction, punctuation etc are really poor whereas they were once thought important. And while they might be trusted, they are not read by many people now, so their influence is weak. We are talking here of weeklies that once sold more than 20,000 now scraping 4,000, most of the decrease down to the concentration on digital publishing and giving away of news. So trusted?Yes. But well written, well designed and well regarded? Not any more. I am a journalist lucky enough to have been trained in the days when objectivity and critical thinking were regarded as professional advantages. Hence I have spent my professional career looking askance at surveys which produce the result likely to be most pleasing to whoever commissioned them. This one is no different, much as I’d love to believe it. He who pays the piper calls the tune. Incidentally, what does “The research also showed that local newspapers are websites are read by an estimated 42m adults in the UK” mean? Someone ought to of looked at that before pressing Send..
Where I am the local daily and weekly papers have all become pale shadows of the titles they once were, now thrown together by inexperienced staff and full of typos and errors with dumbed down easy to obtain content and with a growing reliance on RGC.on top of this the cover prices are regularly oncresrdc so with a weakened product and very little need I’d it any wonder so few people buy copies these days. Craig Nyman should be embarrassed to put his name to this nonsense which is so removed from the reality of the situation as to be an insult to those of us he thinks wil be take in by it. Some one eyed commenting here, too. Too many people continue to judge the state of the news industry readership by its circulation figure when they should be looking at the total audience. If you take the audience coming to websites and reading newsprint as well as looking at apps, then it is pretty hard to say local newspapers have lost their markets. Their audiences are growing. So surely they must be doing something right – serving up content readers want to read – they may not want to pay for it because it is free or more convenient on digital platforms and phones – but that doesn’t mean the content is not interesting to them and they obviously seem to trust what they read rather than what other organisations are serving up – just a thought. Hang on a minute, this research indicates that over two-thirds of the population read local newspaper or look at their websites. Given that circulation figures have been in free-fall for years, now, either a lot of people are sharing their fish and chip wrappers, or the online readership is reaching stratospheric levels. Given that there figures seems to indicate a tremendous number of clicks, the regional press should be rolling in clover, not laying off journos at every conceivable opportunity. Or, there again, it could be just two people reading the regional press 21m times. Nothing to celebrate here. The general public has yet to fully grasp there is little difference between today’s newspapers/websites and social media. Both platforms accept copy from unreliable sources with no checks/alternative views. Editors in many cases are responsible for several newspapers which makes them redundant in a journalistic sense, unable to have a comprehensive oversight on understaffed titles which further allows fake news to prosper in the Press. Not so long ago JP was praising the fact the vast majority of copy in some publications was contributed and on the other hand claiming they have trusted news brands. And, Mr Nayman, sorry, your audiences have gone elsewhere. Web pages don’t have clout, readers spend several seconds on them while avoiding the promotional stuff – and advertisers realise that so they spend elsewhere. Don’t pin hopes on snap surveys which are filled in on a whim – I know I do YouGov surveys! Saddened Journo, you’ve described every T-M regional daily perfectly. Not a day goes past without me reading either a printed copy of the Newcastle Chronicle or the appalling website without despairing at most of the content. The only saving grace is that it still has excellent staff ‘togs that produce great photos when they get the opportunity. “Someone ought to of looked at that before pressing Send.” I think Steerpike ought to have looked at THAT before pressing ‘Send’. Call me a cynical old editor, but if this landed on my desk as a press release I’d probably sigh at a rather desperate PR effort. People might indeed trust the news in their local newspaper and on its website. It’s just a shame there is less and less of it as the weeks go by, for all the reasons outlined above – loss of local journalists, loss of local knowledge, dumbed-down and generic content on websites, centrally-produced content in ‘local’ papers, etc etc etc. Such a pity the likes of Trinity Mirror and Newsquest have no appreciation whatsoever of all the long-established, respected and, yes, trusted brands they are trashing and asset-stripping daily. The latest ABC figures – released today – tell a different story. If people trust their local paper why are so few of them actually buying it? Based on the ABC story, I can see more daily papers going weekly or being closed altogether. Harry. If this combined “readership” is so wonderful why have thousands of journalists been laid off? The quality of writing on websites is even worse than newspapers, but it is true to say this will become less important as the public level of literacy continues to fall, as any glance at social media tells us. I trust my local paper less and less – to be honest I only really engage on it through Facebook because of the ad infested websites. The news they choose to highlight on social media is really poor quality – it’s a mix of shop openings, road closures, product recalls or items lifted from other areas/national news with a smattering of local news now and again. What has really knocked my confidence in them though is the amount of time they have told me ‘it’s going to snow’ (admittedly now yes…ok), but they obviously use it to get hits and all those lovely UGC snow photos, but they are rapidly becoming the boy that cried wolf and people pick up on this. It’s a small point but trust does erode if they don’t print credible and accurate local news. And if local newspaper brands are so trusted, why are they changing to the ‘live’ brand online? Loving the comments on here. Basically, you all disagree with a poll carried out by YouGov to scientific polling standards, so it must be the poll that’s wrong, not that you are out of step with normal readers (i.e. people who don’t have a vested interest in pretending everything was amazing in your golden age). Some of the response on here are laughable in the extreme. Just because fewer people are buying newspapers doesn’t mean they don’t trust the newspaper – just that it doesn’t give them what they want, or that they get it elsewhere. Perhaps if journalists (assuming that’s what you are) spent less time on here banging on about everything that’s wrong with local news and more time looking at how people get their news, you wouldn’t be left howling at the moon. Science vs opinion … you’ll be arguing the earth’s flat next time….. Must be the scientists…..
What’s the saying ‘ he who pays the piper calls the tune”? This how the polling industry scientifically gained such a great reputation for consistent accuracy over the years. I’d rather howl at the moon than rely on a poll that tells me two thirds of the population sees a regional newspaper website and/or a printed copy. If that were true we would indeed be entering a second gold age and we fading doyens of the newsroom could go back to our tomatoes safe in the knowledge that the industry we love is in such good hands. I have no idea Norridge. I assumed you must have some insight though, to suggest on here that yougov would do dodgy, leading polls for cash? When you’ve finished inventing your own laws and howling at the moon Sutler, how about telling us why you don’t think 2/3 of the population see a local newspaper or websites? Being a doyen of the newsroom, even if a fading one, it seems guaranteed you have facts to back up your assertion, not just personal prejudices getting in the way of your journalistic objectivity? No-one likes an over-ripe tomato.